Home Audio Equipment Market size was over USD 19 billion with shipment of over 95 million units in 2016. Growing penetration of technologies such as multi-room solutions and continuous innovations in in-house entertainment systems are expected to propel home audio equipment market growth over the forecast timespan. For instance, Sonos has developed Sonos Bridge that allows users to connect players with wireless routers to play music from any connected device. Consumers are shifting their focus from stand-alone systems to inter-connected devices such as multi-room speakers to enhance their entertainment experience. Growing proliferation of smart devices, such as smart speakers, is encouraging consumers to opt for technologically-advanced systems. Companies in the market are investing in developing differentiated products integrated with advanced technologies; for instance, virtual assistant enabled speakers. In 2017, Sonos launched its Alexa-enabled smart speaker. Also, in 2018, Sonos is planning to launch a speaker enabled with Google assistant. Growing trend of IoT and connected devices is encouraging the consumers to buy connected household entertainment systems. Increasing integration of mobile apps with these devices as a point of interaction with the equipment is driving the home audio equipment market. The devices are being increasingly equipped with Bluetooth and Wi-Fi, increasing the flexibility of these devices to be operated using a smartphone. The growing adoption of Internet-based content, such as music, podcasts, and internet radio, is encouraging the manufacturers to develop products to include several media types. The explosion of e-commerce has propelled the sale of these devices massively. To gain a competitive advantage, retailers are adopting newer strategies to deliver an enhanced user experience. These factors are expected to aid the industry growth over the forecast timespan. 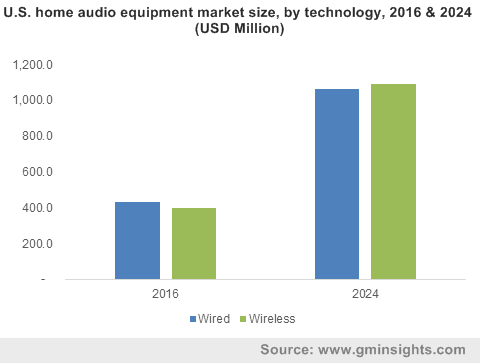 Regulations pertaining to the risk of damage or loss of hearing capabilities are expected to challenge the home audio equipment market growth over the forecast period. The continuous exposure to noise of over 85 decibels for more than eight hours poses threat to the hearing ability of humans. Considering this, various legislative bodies are implementing stringent regulations regarding the use of these devices. High-price (more than USD 1,000) segment in the home audio equipment market is expected to witness a high growth, particularly from Europe, due to the rising consumer focus on acquiring high-quality audio. The device manufacturers, such as Bowers & Wilkins and Bang & Olufsen, offer customized solutions to consumers to match the home décor and styles. Low-price (less than USD 500) segment home audio equipment market is expected to gain momentum over the forecast period owing to the increasing adoption of these devices in Asia Pacific and Africa. Increasing consumer spending capacities in the region are encouraging the consumers to spend on these systems, which were earlier categorized into luxury goods. Increasing need to switch to technologically-advanced products is expected to shift the consumer demand from advanced systems with a higher price range. The demand for speakers is expected to grow rapidly over the forecast timespan, aiding the home audio equipment market growth. Advancements in technologies, such as Bluetooth, DLNA, and Airplay, are attracting the consumer attention. High compatibility of these devices with other devices and a large array of options available for the customers are accelerating the sales of these devices. The ability of soundbars to stream and connect with other portable devices including smartphones and tablets is increasing the customer focus. According to the NPD Group, about 36% of the total soundbar owners connect these devices to at least one portable device. The adoption of new television technologies, such as 4K & 8K, and reducing selling prices of these devices are expected to propel the demand for soundbars, driving the market growth. The U.S. home audio market is expected to witness a large-scale growth owing to the growing number of large personal music libraries. The growing penetration of cloud technology has enabled the consumers to access a large number of songs through easy access to music libraries such as Spotify, Google Play Music, Amazon Music, and Style Jukebox. Increasing proliferation of downloaded and streamed music in the U.S. is pushing the manufacturers to develop devices compatible with these music libraries and smartphones. According to Consumer Technology Association, the U.S. consumers are becoming inclined toward high-resolution audio files downloaded from the authorized sources. This is expected to bode well for the home audio equipment market in the U.S. The China market is expected to grow rapidly over the forecast timespan, owing to a large number of hardware manufacturers. The vendors are manufacturing low-cost products owing to the ease of availability of raw materials and technology. The proliferation of smartphones in the region is expected to aid market growth owing to the increasing penetration and acceptance of compatible music streaming devices. Some of the vendors in the home audio equipment industry include Acoustic Research, AKG, Bose Corporation, Audio partnership PLC., Bowers & Wilkins, LG Electronics, Mark Levinson, Pioneer Corporation, Polk Audio, Philips, Klipsch Group, and Yamaha. The industry is highly fragmented in nature with the majority of players investing in developing technologically-differentiated products. With the development of voice-enabled devices by Amazon and Google, traditional companies in the home audio equipment market are also developing similar products. With this launch, the company has established its presence in the connected devices segment. The company announced its ‘works with Sonos’ badge in partnership with Samsung, Logitech, HDL, and SmartThings. Growing penetration of technologies, such as Bluetooth, play-Fi, and Wi-Fi in the market, has greatly propelled the demand for these devices. Changing consumer preferences and trends are expected to increase the sales of wireless music devices. Companies, such as Sonos, are shifting its focus from traditional high-end devices to multi-room interconnected devices to gain a competitive edge. Increasing spending capacities in developing economies are encouraging North America and Europe-based vendors to establish their manufacturing bases in the countries including Brazil, Argentina, and India. The home audio equipment market is characterized by the recent introduction of several streaming services such as Qualcomm AllPlay, Google Cast, and DTS Play-Fi. As of June 2015, two-thirds of broadband users in the U.S. use the audio streaming device, of which 26% use subscription-based services and 40% opt for free streaming services. These technologies offer the customers greater usage flexibility and high resolution.